South Korean figure skater Cha Jun-hwan is in second place after the men's short program at the Four Continents Figure Skating Championships, setting a new personal best with a flawless performance. 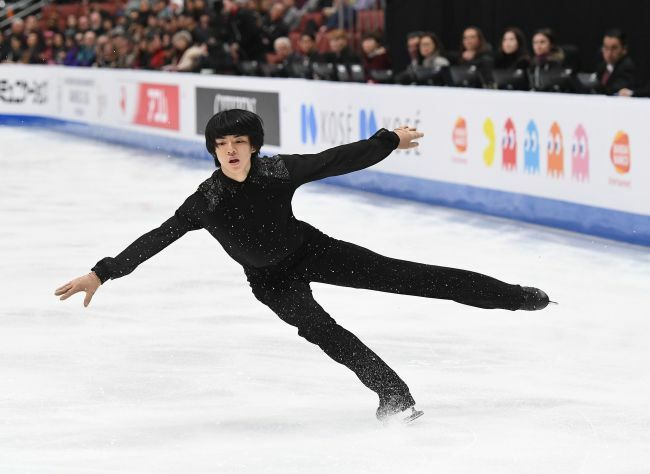 The 17-year-old scored 97.33 points at Honda Center in Anaheim, California, on Thursday (local time) and trails Vincent Zhou of the United States by 2.85 points. The competition is open to skaters from Asia, America, Oceania and Europe. Cha's previous best score in the short program was 90.56 points, set at the Autumn Classic International last September, as part of the lower-tier International Skating Union Challenger Series. No other South Korean man has scored more than 90 points in the short program at an ISU event. Cha is in the midst of his best season. He has already become the first South Korean man to win a medal at the ISU Grand Prix Final, having finished third with a personal high of 263.49 points in December. Cha is leading Jin Boyang of China, currently in third place, by more than five points and is poised to become the first South Korean man to reach the podium at the Four Continents. The 2009 champion Kim Yu-na remains the only South Korean medalist at this annual event. Earlier Thursday in the ladies' singles, South Korea's Lim Eun-soo finished fourth in the short program, just 0.88 point out of third. Cha opened his program with a clean quadruple salchow, his only quad in the routine. He followed that up with a successful triple lutz-triple toe loop combination and later nailed his last jump element, a triple axel. Cha capped it off with a strong step sequence and change foot combination spin, earning the maximum Level 4 for both.